Shipping pharmaceutical products is more complicated than shipping any other item. There are specific guidelines and regulations involved in shipping. It’s important to take the necessary steps to ensure that the pharmaceutical products are intact and useful to the end consumer after shipping. Temperature Control – Temperature is a primary concern when shipping pharmaceuticals. Products must be shipping in containers that are well insulated. Temperature-controlled shipments ensure that delicate pharmaceuticals are kept in optimal conditions. Security – Pharmaceutical cargo types are susceptible to theft and can be extremely dangerous, depending on the type of pharmaceuticals. The greater the number of people who handle the freight, the greater the likelihood that the shipment would be lost, damaged or stolen. Direct, non-stop routes ensure that the delivery is secure with the least amount of handling. Other important security precautions that a logistics company should take into consideration are cameras in the warehouse, satellite tracking and total visibility. Proper Licensure –When choosing a logistics partner, verify that the company has all of the proper licenses and equipment necessary to ship pharmaceuticals. Using a third party logistics company can help your pharmaceutical company pinpoint the exact mode of transportation necessary for your highly valuable products. ShipPharma is a pharmaceutical shipping provider servicing pharmaceutical companies and their fulfillment partners. With ShipPharma, appointment deliveries are guaranteed to arrive in a two-hour window. Additionally, customer service reps are carefully trained to manage your shipments while maintaining the software. For more information on ShipPharma or to find out more information on shipping requirements for pharmaceuticals, contact STC Logistics today. Freight shipping is an option that can save businesses time and money. A reputable third party logistics provider (3pl) has a vast network of carriers, discounts and insurance options that will help make freight shipping a hassle free experience. If the items that you are shipping are bulky, over-sized or on a pallet, then you are in need of a freight shipper. Streamline your processes. The best way to prevent logistical nightmares is to streamline your internal management process and outsource task related job functions. Allowing your logistics partner to use their network and systems enables you to stick to your core competencies. A third party logistics provider can decrease your company’s lead times, improve rates and allow you to step back and focus on the bigger picture of your company. A quality 3pl will provide real time updates for your shipment online and also be able to integrate with your systems. This will enable you to keep on top of your product pick to delivery at all times. Choose a Provider. Make sure that before you choose a logistics company, you understand their basic service packages, pricing structures, turnaround time. Another important thing to learn is how/if the vendor can handle large-scale distribution/rollouts. A good 3pl will be able to coordinate these large projects efficiently while offing volume discounts. Consider freight dimensions. Dimensions should be rounded to the nearest inch and include width, length and height. Carriers rely on freight dimensions to determine the number of individual loads for a specific truck. Dimensions are essential information in order to know the various shipping options a good 3pl should have. Be mindful of packaging. Crating or palletizing your freight shipments will ensure that your freight is not damaged in transit. Label your shipments clearly. Every box or crate in your shipment should have a label which indicates both the shipper and consignee complete address. If your packages get separated, a clear and informative label will be necessary. Additionally, you may add shipper and consignee phone numbers, bill of lading number, carrier pro number and the date shipped. Online pickup requests can provide you with an electronic bill of lading that can help streamline the pickup process. If you’re not sure who to select for your third party logistics provider, you may need a checklist of information to help you out. It is critical that your logistics vendor is superior with customer service, integrated technology and service flexibility. Download STC Logistics’ free checklist, “What to Look for in a Third Party Logistics Company,” for more information on 3pl providers. If you are ready to move forward, Contact Us today. Logistics during the holiday season requires a significant amount of planning. The holiday season begins on November 1, but businesses and logistics providers should begin preparing in October, and in some cases, even earlier. 19% of consumers begin their holiday shopping in October and 40% are holiday shopping during November. High demand for products means that logistics vendors must ensure that the products are able to reach the end consumer. In the United States, it is important to bear in mind holidays such as Thanksgiving, Black Friday, Hanukkah, Kwanzaa and Christmas. Shipping around the holidays creates a significant amount of traffic, so it’s important to keep in mind international holidays as well. The challenge for companies is to successfully accommodate the demand that the peak season brings. Be Proactive – Being proactive about holiday planning is the best way to make it through the holidays smoothly. It’s important to stay in tune with vendors during a rush period. Remember last year’s mistakes – Keep in mind the issues that the last holiday season brought and remedy them. This is an effective way to avoid previous mistakes. Be Flexible – Flexibility is also important. Handling shipments as early as possible ensures that customers are satisfied even if there happens to be a delay in shipment. Bring in backup – Many companies choose to meet this demand by relying on the help of logistics service providers. Effective supply chain execution is the difference between getting products to customers on time… and not. By reducing the amount of goods that arrive late to retailers, companies can avoid discounting their products after the holidays to move them out of stores. STC Logistics offers a highly efficient, round the clock operation to help alleviate the demands of the holiday season. Our extensive network ensures that your goods will arrive to its destination promptly and safely. Our Customer Service professionals work with you to determine the best and most cost-effective way to get your shipment to its destination. 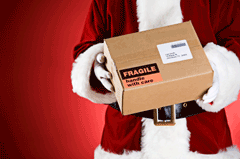 Click Here to request a quote for your holiday shipments. Author STCBlogAdminPosted on October 24, 2012 June 16, 2016 Categories Logistics, ShippingLeave a comment on Welcome to Logistically Speaking! Welcome to Logistically Speaking – your resource center for shipping and logistics! Logistically Speaking is dedicated to providing companies with important information about shipping their products. Our blog posts will cover a wide range of topics including how you should ship, when to ship and news within the logistics industry. If you want to learn more about how to streamline your company’s shipping, we’ve got you covered! STC Logistics is a Total Source Solution for handling all of your transportation needs. Our accomplished representatives provide expert consultation for even the most complex traffic departments. This experience, combined with our vast network of nationwide secure cross-docking facilities, gives us the knowledge you need about your company’s logistics. We are committed to providing superior, flexible logistics solutions, and we are ready to share our expertise with you. We’re excited to launch this blog for people seeking information about logistics. Feel free to ask questions and leave comments below. We will be sure to address anything you need! We suggest that you subscribe to our blog to keep up to date on important industry topics. To subscribe, all you need to do is enter your email address in the text bar to the right of the screen. When we post information about shipping, logistics, and industry news, you will be updated via your email address.